TIME magazine has published a five page spread on Ron Paul’s presidential campaign that hits newsstands yesterday. While some are declaring this a lifting of the veil on media coverage of the Congressman, the reality is that the piece will go out of its way to convince readers that Paul is a fad and has no chance of winning. Washington Post blogger Erik Wemple today shared a post entitled “News media reverses Ron Paul blackout”, which links directly to a Politico article that contends “Ron Paul scores success in media assault”. “Paul’s complaints contributed to Time’s decision to do its first major piece on him this campaign season,” the Politico article states. On the surface this sounds great from a Ron Paul follower’s point of view, however, it quickly becomes clear from reading Altman’s blog that the Time piece represents a continuation of the desperate establishment attempt to convince voters that Ron Paul does not have a snowflake’s chance in hell. In his explanation of the upcoming Time piece, Altman opines, “Paul is probably not a credible contender for the nomination,” attempting to convince readers that his ideology and policies do not resonate with voters. “His foreign policy of nonintervention is a nonstarter among neoconservatives. His view that social issues like abortion and gay marriage should be left up to the states causes social conservatives to blanch,” writes Altman. Ron Paul can’t win because he appeals to traditional conservatives who believe in small government, to leftists who believe in personal liberty, to ‘blue’ democrats who believe Obama has betrayed the party, to independents who voted for Obama but are disgusted with the Hopey-Changy that never happened, by gays who don’t want government dictating marriage rules, by straights who don’t want to be forced to live by a ‘gay agenda’. Gee…left, right, young, old, conservative, liberal, gay, straight…with all that support, he doesn’t have a chance! Last time I checked, Paul was placed third in Gallup’s national presidential preference poll, and is running at an almost dead heat with Obama in the popularity stakes. It has been an average week as far as Ron Paul appearances on the news networks are concerned. He’s been on CNN a couple of times, Fox News a couple of times and appeared on CNBC also. There have also been more print media stories this week, primarily, and rather paradoxically, reporting the fact that the media is not covering Ron Paul. 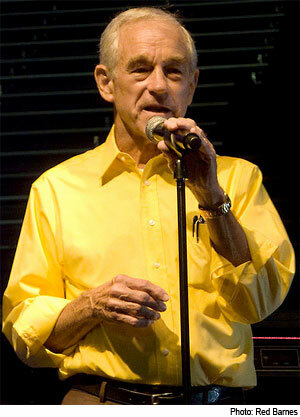 So the fact is that Ron Paul is no longer being completely ignored by the media. However, as Time has made it all too obvious, he is still being marginalized and ridiculed. When the time is right for them, the media will simply ignore Paul again – this is the stark reality that the Congressman’s campaign and his followers have to deal with and overcome.